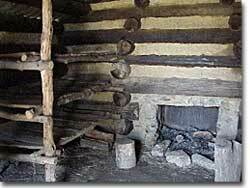 Cold, hunger, and sickness marked the Continental Army's stay at Valley Forge in Pennsylvania. 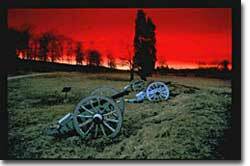 Today, Valley Forge's wide fields are dotted with revolutionary relics, reminders of the brutal winter endured by Washington's troops. American spirits reached a low point during the harsh winter of 1777-78. British troops had marched triumphantly into Philadelphia the previous autumn. Philadelphia was the largest city in the Colonies and the seat of political power. After the British swept into Philadelphia, the Continental Congress had flee to west, first to Lancaster then to York. Great events generate great legends. Did an Oneida woman named Polly Cooper, really ease the suffering of Washington and his troops at Valley Forge? Historians may never know for sure, but the legend lives on. Impressed with this idea, I am, on my part, putting every engine to work, that I can possibly think of, to prevent the fatal consequences, we have so great a reason to apprehend. I am calling upon all those, whose stations and influence enable them to contribute their aid upons so important an occasion; and from your well known zeal, I expect every thing within the compass of your power, and that the abilities and resources of the state over which you preside, will admit. I am sensible of the disadvantages it labours under, from having been so long the scene of war, and that it must be exceedingly drained by the great demands to which it has been subject. But, tho' you may not be able to contribute materially to our relief, you can perhaps do something towards it; and any assistance, however trifling in itself, will be of great moment at so critical a juncture, and will conduce to keeping the army together till the Commissary's department can be put upon a better footing, and effectual measures concerted to secure a permanent and competent supply. What methods you can take, you will be the best judge of; but, if you can devise any means to procure a quantity of cattle, or other kind of flesh, for the use of this army, to be at camp in the course of a month, you will render a most essential service to the common cause. I have the honor etc. These cabins may appear sturdy from the outside, but a closer look reveals their sparse and makeshift character. Imagine sleeping on one of those bunk beds. The next year, 1778, brought greater fortune to the American cause. While Washington froze at Valley Forge, Benjamin Franklin was busy securing the French alliance. Now the war would be different indeed. It is not in the power of Philosophy ... to convince a man he may be happy and Contented if he will, with a Hungry Belly. Give me Food, Cloaths, Wife and Children, kind Heaven! and I'll be as contented as my Nature will permit me to be. At this American history website specializing in primary documents, read the gruesome details of the horrible winter from a surgeon who kept a diary from those desperate days. This Prussian drill instructor served Frederick the Great of Prussia, widely considered the greatest military genius of the era. After arriving in Valley Forge, which was filled with a pathetic and disillusioned troops, von Steuben created an army out of a ragged militia and helped turn the tide of war. Who won the Battle of Valley Forge? If you answered "the British" or "the Americans," check again. There was no Battle of Valley Forge! This fantastic website, created by UShistory.org, is broken down into several parts covering all the basics and much, much more. Read about French help, spy tactics, and even the weather report. There are lots of great pictures and a couple of fun activities, too. 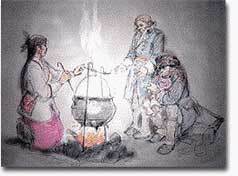 Why were Washington and his army starving and freezing in Valley Forge? Because the British were feasting in Philadelphia. Learn more about the Philadelphia campaign. Before Washington got to Valley Forge, one of the places he stayed was at Moland House, which served as his headquarters on August 10, 1777. Here, the Marquis de Lafayette joined the American Revolution, and the American Flag was said to have first flown over American troops. The Warwick Township Historical Society provides information about the house and the encampment as well as directions for anyone thinking of visiting. Although the homepage of the National Park Service's website on Valley Forge is rather lackluster the "inDEPTH" link leads to much information about this historic national site. Of course, the park service provides all the pertinent information visitors need to take a trip to Valley Forge. December 12, 1777: "We were order'd to march over the river — It snows — I'm sick — eat nothing — no whisky — no forage — Lord — Lord — Lord." The diary of Albigence Waldo reveals much about Valley Forge. Just a few months before the brutal winter, the British inflicted a devastating surprise attack on "Mad" Anthony Wayne and his troops in Paoli, Pennsylvania.